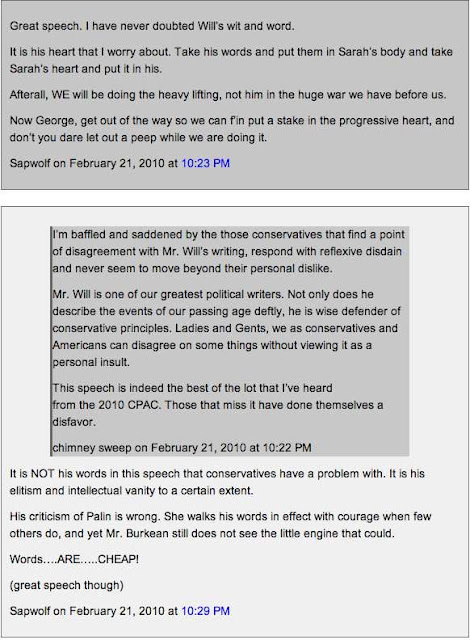 It's striking to me how the pundits I like best, George Will (Oxford, Princeton) and Charles Krauthammer (Oxford, Harvard), reject Sarah Palin as not smart enough, inexperienced, policy light, whereas another very smart pundit, Mark Steyn, is pretty pro-Palin, like me, while reserving some judgement, like me. Well it's obvious what George and Charles have in common. They're both dry, cerebral, irreligious, disabused, fluent, efficient in word and thought and I like that. Steyn and Adams are both Marks, they both have curly hair, they're both playful with words and both educated at English public (ie private) schools. Neither Mark went to university; Steyn was a disc-jockey at 18, Adams took a Classics Exhibition to Cambridge at 16, then changed his mind and hitch hiked off to an improbable future. I postulate that George and Charles simply can't get past their academic bias in judging Palin, whereas the Marks have a broader band experience of the whole world, especially of self-made achievers, and can sense excellence in Palin for which Oxford/Harvard types have narrow band receptors. That excellence is courage, "the first of human qualities because it is the quality which guarantees the others" as pointed out by by another English public schoolboy who didn't go to university. Governor Palin is not merely..."all-American", but hyper-American. What other country in the developed world produces beauty queens who hunt caribou and serve up a terrific moose stew? As an immigrant, I'm not saying I came to the United States purely to meet chicks like that, but it was certainly high on my list of priorities. And for the gun-totin' Miss Wasilla then to go on to become Governor while having five kids makes it an even more uniquely American story. Next to her resume, a guy who's done nothing but serve in the phony-baloney job of "community organizer" and write multiple autobiographies looks like just another creepily self-absorbed lifelong member of the full-time political class that infests every advanced democracy. Sarah Palin and Barack Obama are more or less the same age, but Governor Palin has run a state and a town and a commercial fishing operation, whereas (to reprise a famous line on the Rev Jackson) Senator Obama ain't run nothin' but his mouth. She's done the stuff he's merely a poseur about. Post-partisan? She took on her own party's corrupt political culture directly while Obama was sucking up to Wright and Ayers and being just another get-along Chicago machine pol.. Governor Palin has what the British Labour Party politician Denis Healy likes to call a "hinterland" - a life beyond politics. Whenever Senator Obama attempts anything non-political (such as bowling), he comes over like a visiting dignitary to a foreign country getting shanghaied into some impenetrable local folk ritual. Sarah Palin isn't just on the right side of the issues intellectually. She won't need the usual stage-managed "hunting" trip to reassure gun owners: she's lived the Second Amendment all her life. Likewise, on abortion, we're often told it's easy to be against it in principle but what if you were a woman facing a difficult birth or a handicapped child? I kinda like the whole naughty librarian vibe.